Tray Size 12" x 0.625" x 0.875"
(30.4 cm x 14.2 cm x 2.2 cm) One 15.25" x 9" x 1.25"
One 14" x 6.25" x 0.875"
Automatic Cycles and Self Cleaning Saves You Valuable Time! Harvey MC8 and MC10 sterilizers offer the convenience of four pre-set keep cycles and self-cleaning non-recirculating operation in a design to fit your benchtop and your budget. The time saving one button operation cycles the unit from start to finish. The optional non-recirculating feature makes this already reliable unit even more trouble free by preventing the recirculation of debris and contaminents reducing costly routine maintenance and down time. Pushing one button cycles the unit from start to finish. Choose from four pre-set programs for sterilizing wrapped or unwrapped instruments, packs, or liquids. Time-temperature interlock assures chamber conditions are correct before the cycle begins. Preheated chamber reduces total cycle time. At the end of the cycle, drying starts automatically. The non-recirculating option can increase the reliability of the MC8 and MC10 by preventing the recirculation of debris and contaminents which can clog internal components and filters. With this unique option the operational lifetime and reliability of your sterilizer can be significantly increased. It takes just minutes to empty the removable container, and even this can be eliminated by easily connecting the system to a sink. Costly routine maintenance and down time are greatly reduced. The 2 1/2 hours that other sterilizers require are eliminated with our unique non-recirculating feature. Even without the new non-recirculating feature, the MC8 and MC10 sterilizers are easier to clean than others. The removable cover provides easy access to see at a glance when the reservoir needs to be cleaned. There is no need for expensive solutions or time-consuming back flushing. Cleaning takes minutes not hours. Unwrapped loads dry even with the door closed, giving maximum protection against airborne contaminents. For full and wrapped loads, the most efficient drying may be achieved with the door open. There's no better way to extend the life of your instruments. The Harvey Chemiclave is a fully automated and proven device for sterilizing medical and dental instruments without dulling, rusting, corroding, or otherwise impairing their properties. The chemical vapor process protects your investment in instruments. Unlike the humid environment produced by conventional steam, the unsaturated chemical vapor method is a low-humidity process. No time-consuming drying phase is needed, because nothing ever gets wet. What's more, the heat-up time is shorter than for most steam sterilizers, and the heaters stay on between cycles to minimize warm-up time and increase the instrument turnover. Harvey Chemiclaves use a proprietary sterilant solution, Harvey Vapo-Steril, which contains a trace of formaldehyde (less than one quarter of one percent). When used as directed, standard Chemiclaves operate well within United States safety standards for formaldehyde emissions. Technical data available from Barnstead-Thermolyne. 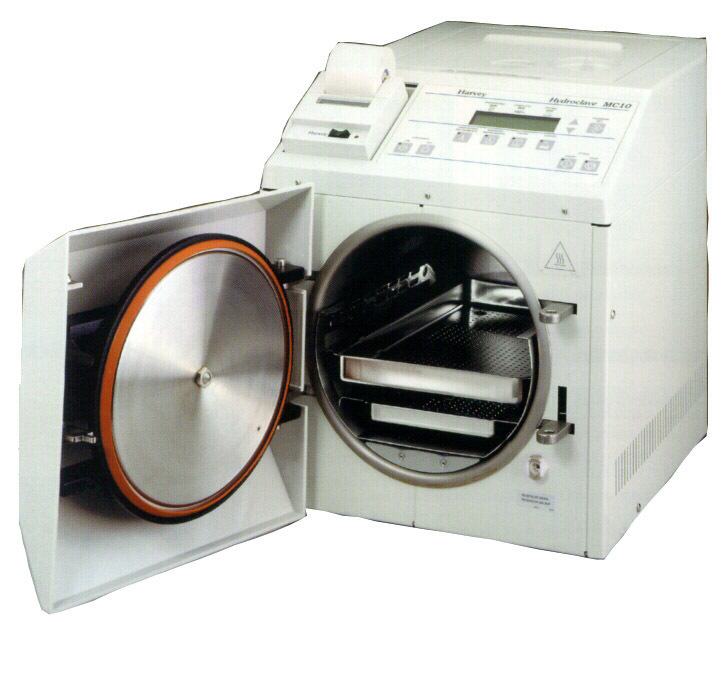 The EC Series Chemiclave Sterilizers' controls are easy to operate. No complicated microprocessors are used. An electronic timer times the 20 minute exposure phase and the purge phase. Chemiclaves feature a unique diameter-indexed filling system. The Vapo-Steril flow, automatically when full to prevent spillage. The system also prevents the use of incorrect solutions. When the cycle is complete, a buzzer and light indicate "exposure complete". When the dial is turned to "depressurize", the Chemi-purge injects compressed air into the chamber to speed displacement of residual chamical vapor through the Chemi-filter. Chemiclaves feature a built-in motorized Chemi-purge system which includes a Chemi-filter to virtually eliminate potentially objectionable odor. Calll now 1-800-748-1259 to purchase the sterilizer, or click here to order (almost) on line ORDER-FORM. All contents were copyrighted in1997 by Alfa Medical. It may not be copied, reproduced or distributed without prior written permission.